Elsa Lunghini – T’en Va Pas – Official Music Videos. The song was written by Catherine Cohen, Romano Musumarra and Régis Wargnier (lyrics), Carol Welsman (lyrics – English version). 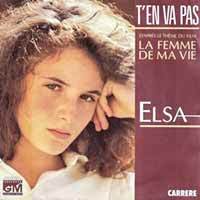 It was released as a single from the soundtrack to French film La Femme de ma vie (The Woman of My Life). It was released on 12 October 1986 reaching number 1 on the singles chart in France for eight consecutive weeks. It also reached #26 on the Eurochart Hot 100. English version “Papa Please Don’t Go” was released in 1987 with “T’en Va Pas” on the B-side.